Movies have the power to take you from reality to strange, fantasy worlds. Sadly, that movie “magic” can be lost through a blooper. Thankfully, most people miss a lot of those mistakes because they are so entranced by the film they are watching, so the magic is not completely lost. However, we couldn’t help ourselves, and just had to go back and find all the bloopers that you most likely didn’t notice, and now won’t be able to ever forget. The 1995 film, Braveheart, followed a warrior as he led the Scottish in a rebellion against King Edward I of England. The warrior, William Wallace, was played by Mel Gibson. 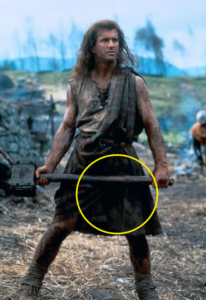 Throughout the film Wallace is wearing a kilt. The film is set in the 1300’s. However, the kilt was not created until the 16th century. The film won multiple Oscars, including Best Picture and Best Director, but not Best Costumes…perhaps this is why?